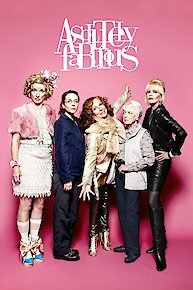 Absolutely Fabulous, commonly known in television and culture as 'AB FAB', features the trivial dilemmas and documentary adventures of two middle-aged women trying to recapture their youth through outlandish spectacle and endless partying. Principle characters, Edina 'Eddie' Monsoon, the owner of a failing public relations firm and Patsy Stone, a washed-up fashion magazine editor, routinely grate on the nerves of Edina's conservative daughter, Saffron, for their childish semantics and exaggerated self-absorption. Throughout the outrageous escapades of Eddie and Patsy, Eddie's mother lives in her own world of satirical denial with the attitude, "girls will be girls." The interaction of the characters paints a comedic portrait of opposing views and lifestyles. Produced by the BBC, Absolutely Fabulous has gained a devout following both in the UK and abroad. The show originated from the creative minds of writers and comediennes, Jennifer Saunders (who plays the lead role of Edina Monsoon) and Dawn French. Essentially, Absolutely Fabulous is an expansion of the French and Saunders comedy sketch show made popular in the UK's, Comedy Strip. On the show, Saunders is joined by veteran actresses, Joanna Lumley (Patsy Stone) and June Whitfield (Edina's mother) to further spice up the show's daring grit and dry humor. The character, Saffron, Edina's conservative and uptight daughter is played by English-Jordanian actress, Julia Sawalha. Absolutely Fabulous is consistent in drawing viewers with its dynamic wit and uncompromising comedic flare. Edina, Mother, Patsy, and Saffron all present the issues common to most people but without taking life too seriously. Even the London 2012 Olympics aren't safe from the disgraceful duo as Eddy and Patsy play their own very special part in this prestigious sporting event. Eddy rents out her house to someone rather important (Hollywood, darling), and the ladies schmooze some rather famous UK athletes, as only they know how. With less and less clients and a daughter who dislikes her, it's business as usual but after Eddy and Patsy meet a famous French film star whom Saffy likes, Eddy hopes that she could finally have some new-found respect. Eddy offers to represent her and decides to hire the Albert Hall for her to perform in. The problem is though that when Jeanne opens her mouth to sing nobody can hear her. Eddy calls Emma Bunton and Lulu in to help with the problem. It is Bubble though who ends up solving the problem. Twenty years after Eddy, Patsy, Saffy, Bubble and Mother first staggered into our lives, they're all back. One of them has been away for some time, so there is lots of catching up to do. She returns with a new best friend, who is both a blessing and a threat to the household. It forces them closer than ever. It may even involve one of them owning up to her real age. Times are tough for Edina. She doesn't have the clients she used to, the ones she has are jumping ship, and her daughter despises her. Still, she has a plan to kill two birds with one stone. The famous French film star Jeanne Durand is looking for representation, and Saffy idolises her. If Eddie can get Jeanne to sing at the Royal Albert Hall, perhaps everything will turn out alright. Saffy is released from prison after serving two years for forging passports. Funny thing is, she can't recall actually committing the crime. Edina tells Saffy she is welcome to invite her prison friends around, only to regret it when the alarming drug dealer Baron shows up. Turns out Patsy owes Baron a lot of money. Of course, Mother may have an answer. Will anybody take the time to listen to her? Patsy hates Christmas and refuses to acknowledge its existence. Unfortunately Eddie has plans this year and for the very first time, she wants to stay at home with Saffy and her granddaughter. All of this Christmas spirit is too much for Patsy and she finds herself in a downward spiral. Baby Jane's crying is driving Eddy nuts. Saffy isn't finding much joy in her new motherhood either. But help is at hand in the unexpected form of Patsy. Unbeknownst to Saffy, Patsy has found Jane a modeling assignment. Now if Saffy can just be persuaded to leave the house with John. Eddy has rekindled her relationship with childhood sweetheart Pete. He's an engineer at Abbey Road studios and has found some lost Beatles recordings. In order to trumpet the discovery Eddy wants to throw a listening party. Elton John is of course invited. It's a big night for Patsy. She's about to host the Style Awards at the Royal Albert Hall. Saffy having reached blimp-size is about to go into labor and opts for a home birth. But her water breaks at an unfortunate moment. Eddy is off on a weekend of adventurous pursuits in the country with Patsy. They are disappointed to find that hunting and killing small animals is off the menu. Meanwhile Saffy is at home hanging out with her girlfriends - Emma and Sarah. But Sarah starts to display an unhealthy interest in Emma's fame. Eddy has installed a state of the art 'panic room'. It contains Closed Caption TV monitors, board games and, of course, alcohol. Meanwhile Patsy has an eventful day at Jeremy's and meets Minnie Driver. Patsy persuades her to visit Eddy's for a personal styling session, but things don't quite go to plan. Saffy receives a visit from her sadistic midwife and is subjected to a demonstration of the most painful aspects of childbirth. Eddy meets with her book club and is distressed to find that Elizabeth Hurley has pulled out. Patsy, Plum and Mariella Frostrup turn up to discuss the merits of OK! Magazine. Saffy has been away in Iraq as an aid worker and Eddy has had no-one to curb her extravagance. Her clients have also deserted her in droves. But she continues to take little interest in her remaining client - Emma Bunton. When Saffy finally arrives home she has some shocking news in store for Eddy. "Absolutely Fabulous," the cult British comedy about a bunch of snotty, privileged, self-obsessed, drunken, lovable fashion whores is coming back to a TV near you. The BBC and Logo announced today they'll be releasing three new special episodes of the series, featuring the original cast members. Absolutely Fabulous is currently available to watch and stream on . You can also buy, rent Absolutely Fabulous on demand at Amazon Prime, Amazon, Hulu, Vudu, Google Play, iTunes online.